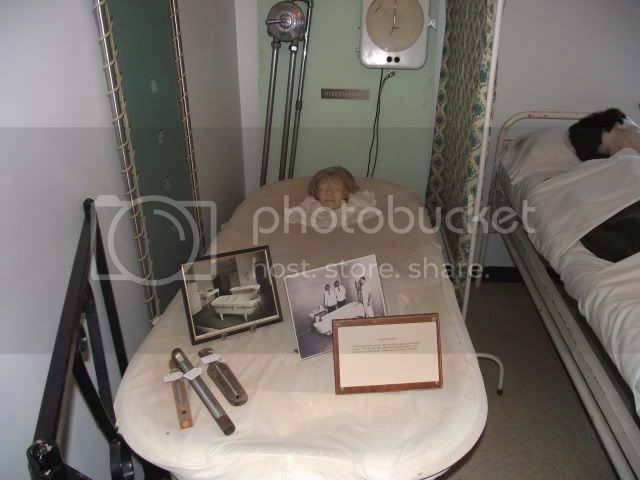 Getting to the Glore Psychiatric Museum in St Joseph, MO has been the #1 goal since I started this blog, and it's also the #1 "tip" I receive from readers. Since it is so popular, and since I'm having such a hard time paring down the 200 pictures we took, I'm going to divide this into two parts. Today we're going to talk about the history of the building and of psychiatric treatment. 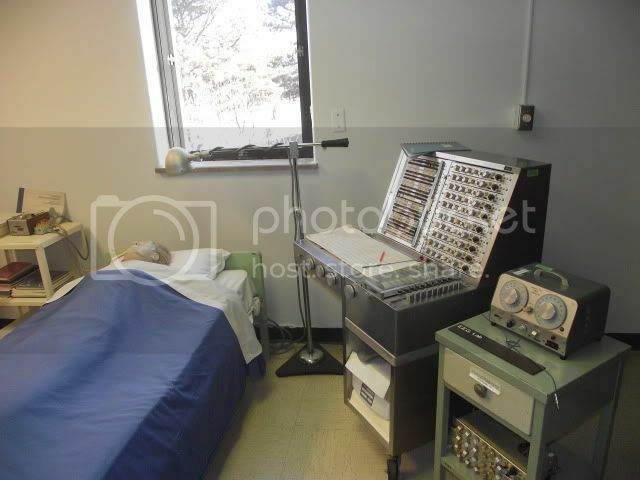 The Glore Psychiatric Museum started as the collection of George Glore, who worked for the Missouri Department of Mental Health and St Joseph State Hospital from 1956-1996. Originally called State Lunatic Asylum #2 when it opened in 1874, and then State Hospital #2, it became St Joseph State Hospital in 1952. 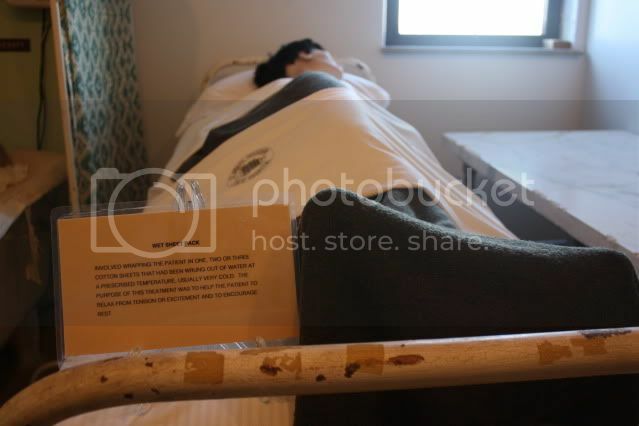 The museum is housed in a building that was once the admitting ward and hospital, and services for the mentally ill are now provided across the street at Northwest Missouri Psychiatric Rehabilitation Center. 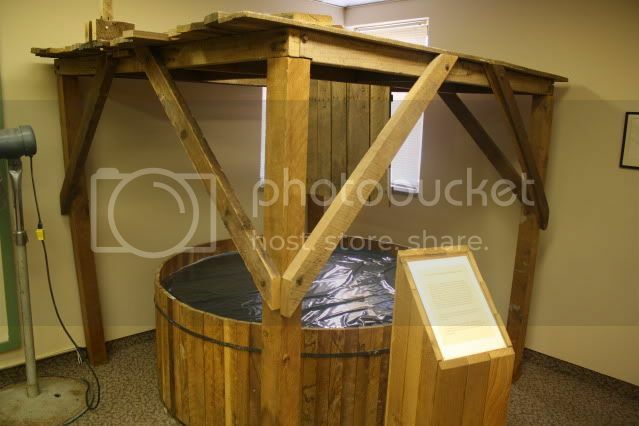 Above is a depiction of hydrotherapy, which was just a warm bath used to calm agitated patients. 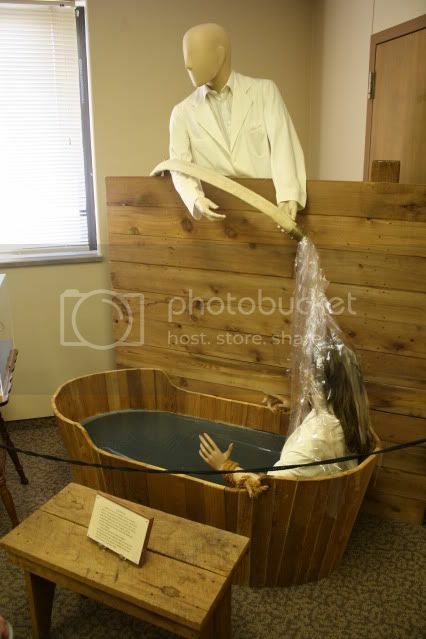 This practice is not really used anymore since we have drugs that are more effective than trapping a person in a bathtub. 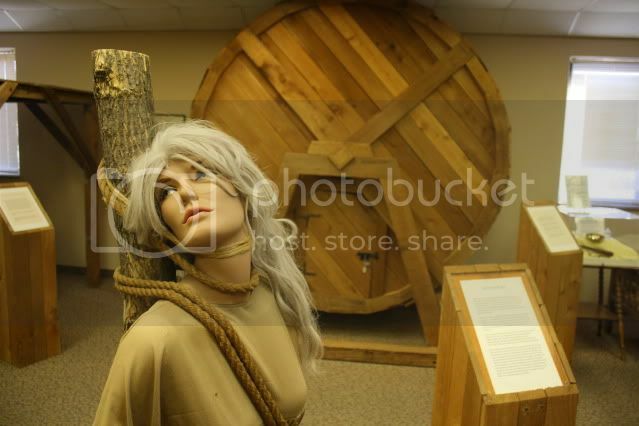 Sidenote: the glamour mannequins used in these displays were donated to the museum by a department store. It is, to say the least, startling to round the corners in this museum. Likewise, a wet sheet pack (usually using cold water) served the same purpose. According to the dedication plaque at the entrance, the purpose of George Glore's collection is to explain how the treatment of mental illness has improved, and to educate through the experiences of mental patients. The thing to remember here is that, while some of these things seem horrifying or barbaric to us now, they really were doing the best they could with the information available at the time. Above is a depiction of insulin shock treatment, which was used to treat schizophrenia. It was a long and dangerous process that basically only had the benefit of making the patient more relaxed afterward and slightly more cooperative with psychotherapy. The "Golden Rule" posted elsewhere in the building says, "Do unto others as you would be done by. No one is immune from mental disease. Any employee of this hospital may, by a freak of fate, become a patient. Let your care of patients be what you would desire for yourself, or any member of your family, if mentally ill." This is from the 1931 Employee Handbook for State Hospital #2. Kind of surprising, isn't it? Like I said, they did the best they could. St Joseph State Hospital also treated people with syphilis. 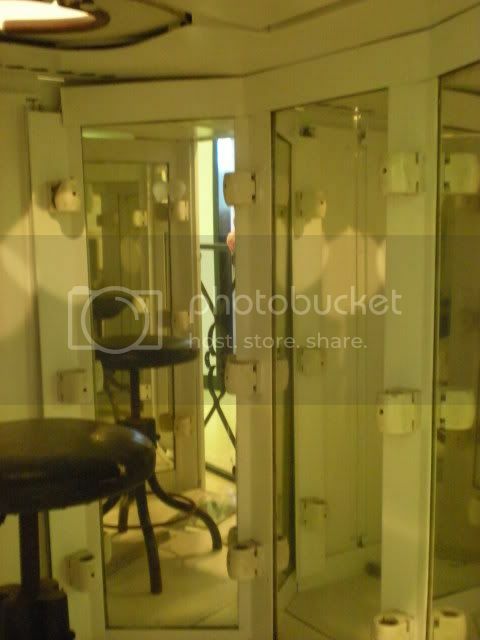 Above and below are exterior and interior photos of a fever cabinet, or hot box. As you can see in the picture below, the inside of a fever cabinet is covered in light bulbs and mirrors that raise the interior temperature to 105 degrees. A similar treatment using malaria was also used back then. The idea here was that inducing fever would kill the spirochete (bacteria) that causes syphilis. It worked, but the treatment could be more dangerous than the disease itself. Today, syphilis is cured with penicillin. As mentioned at the beginning, this building was once the hospital/clinic for the State Hospital. 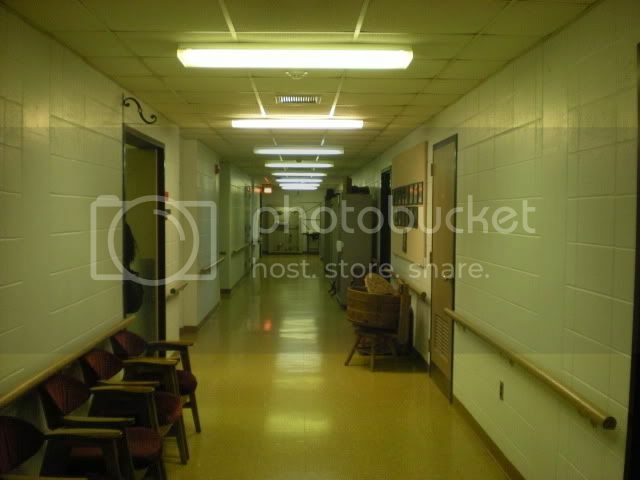 They had a dentist and ophthalmologist, x-ray lab, occupational therapy, surgery, and a morgue. 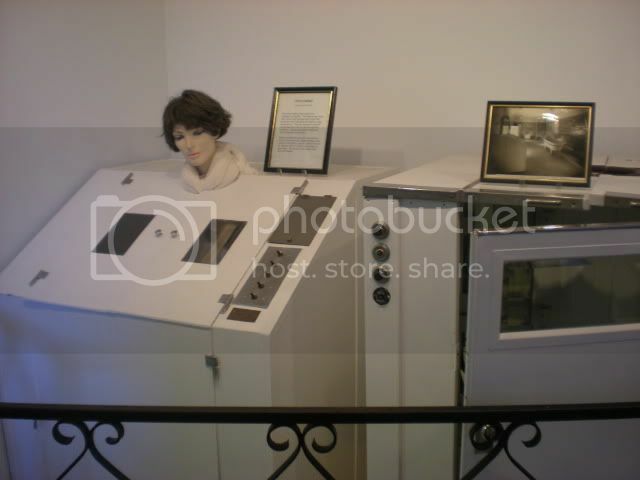 One of my favorite displays was the story of the EEG machine. 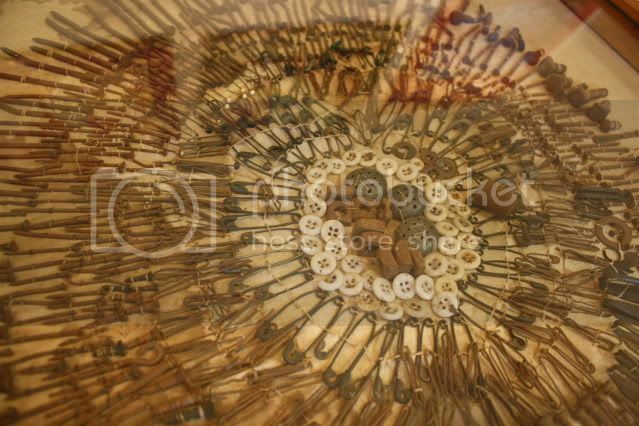 This is an artistic display, artist unknown, of 1,446 items found in the stomach of a woman who suffered from compulsive swallowing of non-food objects. 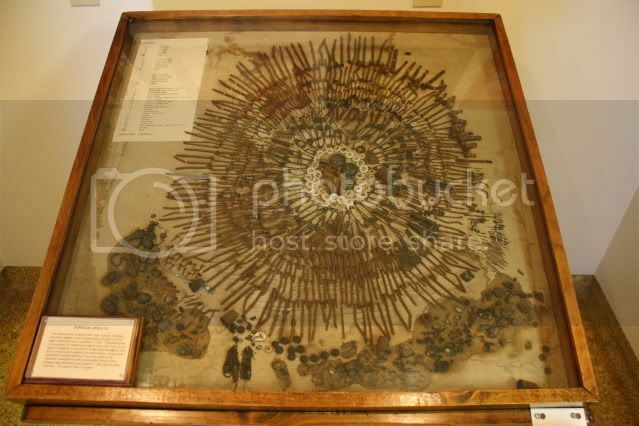 Items removed included 453 nails, 42 screws, 9 bolts, 7 broken coat racks hooks, 5 thimbles, 3 salt shaker tops, 105 hair pins, 115 safety pins, 52 carpet tacks, and 37 needles. Sadly, she died in surgery when they tried to remove them. 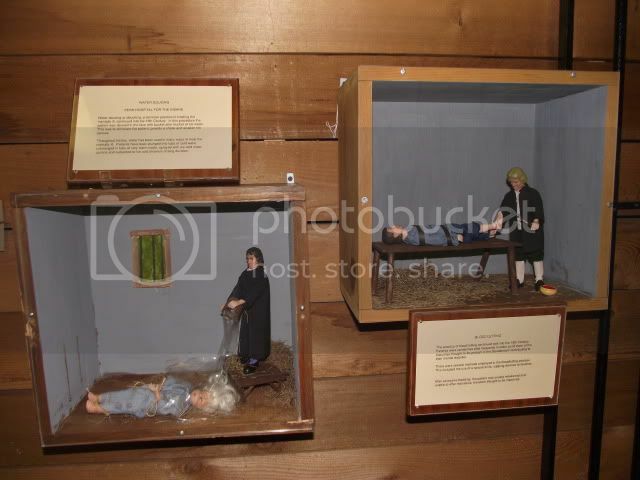 The museum started in 1968 when George Glore worked with hospital carpenters and patients to create an exhibit for Mental Health Awareness Week, creating full size replicas of mental health treatments from the 16th, 17th, and 18th centuries. It was such a hit that he was encouraged to expand. These replicas occupy one large room in the current museum. Behind the witch being burned at the stake is the Hollow Wheel from the late 18th century, which was similar to a treadmill, or hamster wheel, and was used to wear out feisty patients. The difference here was that they were locked inside, sometimes for 48 hours at a stretch, and had to either keep moving forward or backward, or stand perfectly still. Any attempt to break out would be thwarted with a good shove of the wheel by the attendant, which would force the patient to keep moving. 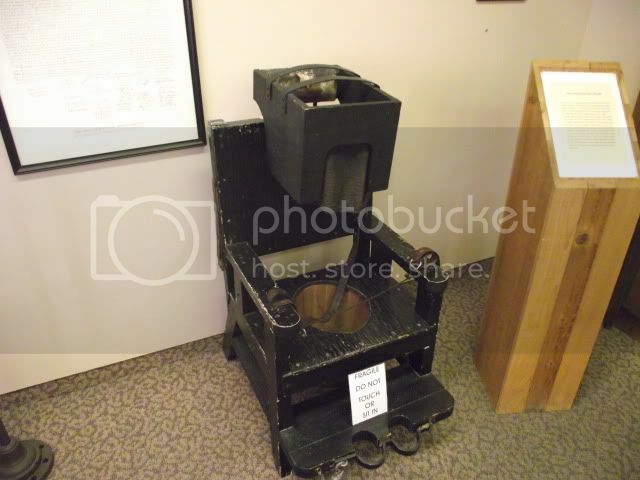 Next we have the tranquilizer chair, invented by Benjamin Rush, in which patients could be imprisoned for up to 6 MONTHS. Dr Rush was a big fan of bleeding - he even had a promotional bleeding knife distributed by a drug manufacturer - and believed that mental disorders were caused by too much blood to the brain. The idea behind this chair was to restrict movement and quiet the pulse. These are dioramas made by a patient. Above left, restraint devices from the 16th and 17th centuries. Above right, physicians "stomping the devil out" of a man. Below left, water dousing or douching, in which cold water was thrown into the face of the patient to shock them to their senses. Below right, bloodletting to release impurities in the blood thought to cause mental disorders. There's a full size replica of the water douching above. And finally, the Bath of Surprise. It's pretty much what you would expect from the name. The patient sat on a trapdoor above the pool, and was dunked without warning. Seems rather labor intensive and cumbersome for an effect that could be accomplished with a bucket. Okay, I think that's enough for one day! 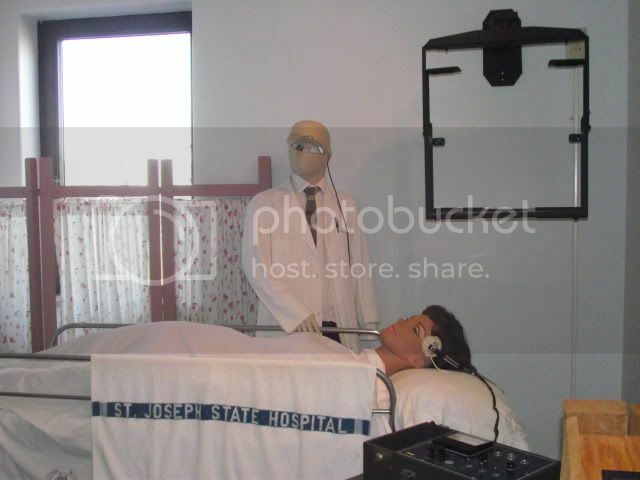 Tune in next week when we will talk about what the patients did with their time at St Joseph State Hospital! I love this museum! The history of the grounds is just as intriguing as the history inside the museum. Very cool. Man why do I love this kind of stuff, crazy, but awesome post. I agree with Anonymous above. What particularly made me nauseous is the "artistic display" of the 1400 items found in the stomach of the patient. Just went here about a month ago. It was very interesting, sad, fascinating, macabre, and just a great place to go. I saw on tv there are paranormal activity inside museum, is it true? Return to the Laclede's Landing Wax Museum!